So far it's worked out really well and been quite comfortable to hold. I actually found out too late about this one. Wanted one of these as well. Happy to see one get paint! 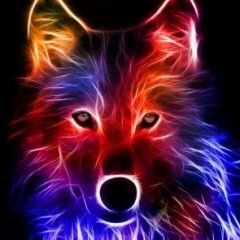 BONUS POINTS for painting a WOLF! FWIW, they've stated they'll be selling more of them on special occasions. By my reckoning they should have at least a couple hundred more to sell, if they made the quantity they said they were going to. They didn't offer it as an option in this last kickstarter, but if it shows up I'll try to let you know. No, I wanted the whole deal. What's your 'friend' looking for? Drop me a PM. I was actually wondering what @Glitterwolf was looking for.. 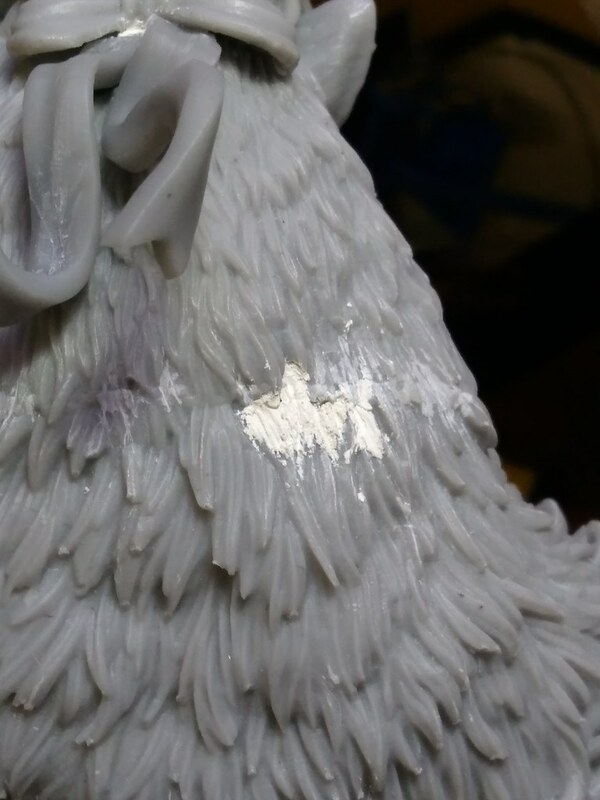 I have the worst luck with trying to get stuff like this to line up, plus I figured it would be a real pain to paint around, and I'd probably knock one or both pieces off, so i decided to carve the chain off the figure, and do some minor carving to redo the texture. I think it turned out pretty well. 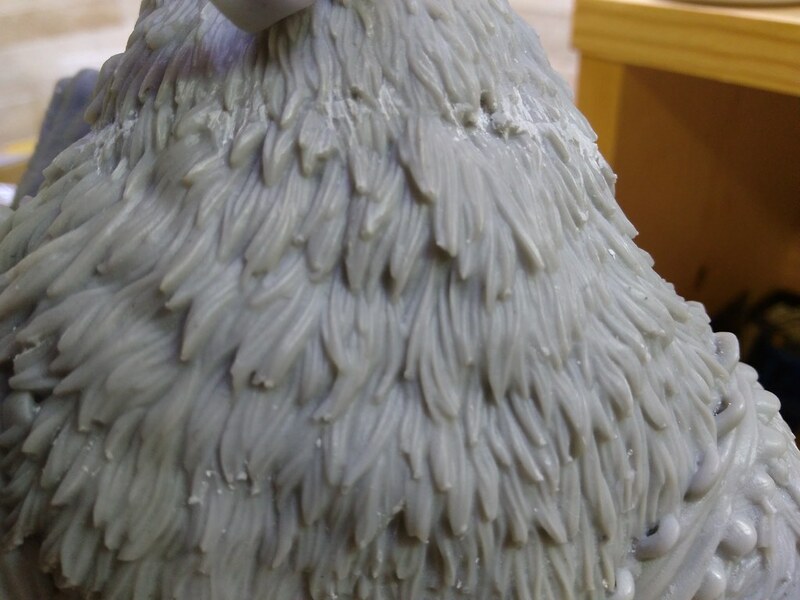 FWIW, this is a pretty hard resin Not really brittle, but it's definitely some of the harder stuff I've tried to carve. Ohhhhh my, I might have to find a way to a) get extra money and b) get one of those! The glasses broke in transit so I pinned them with thin brass wire and glued them back together. 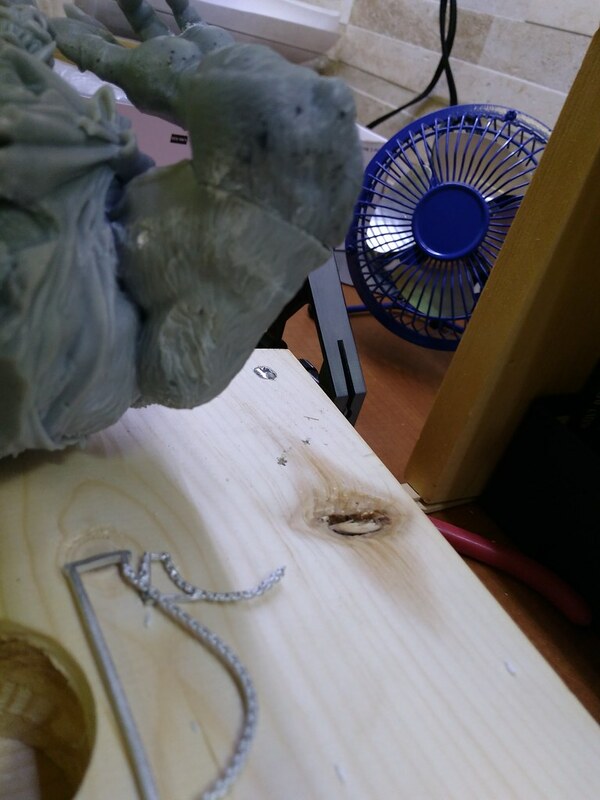 I've had to re-glue the joint since then and it's going to be a point I'll have to watch for in the future. 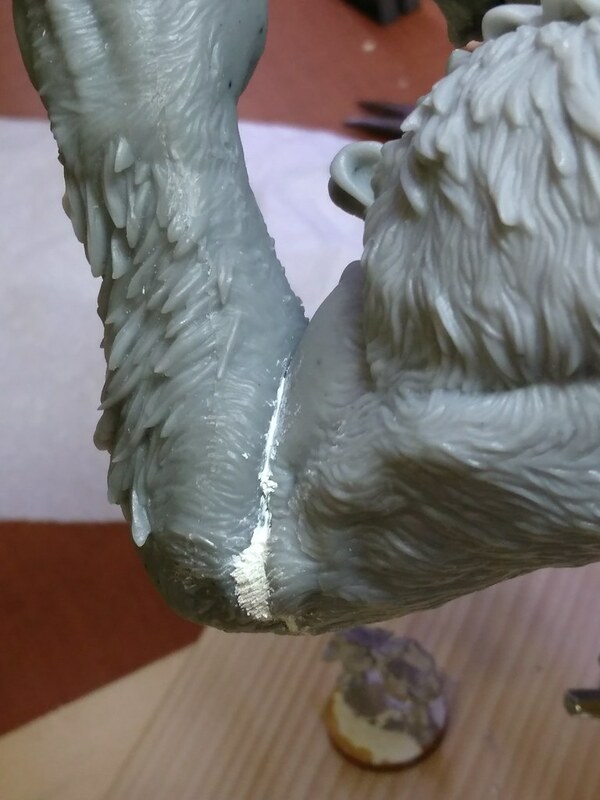 All the seams needed putty work. 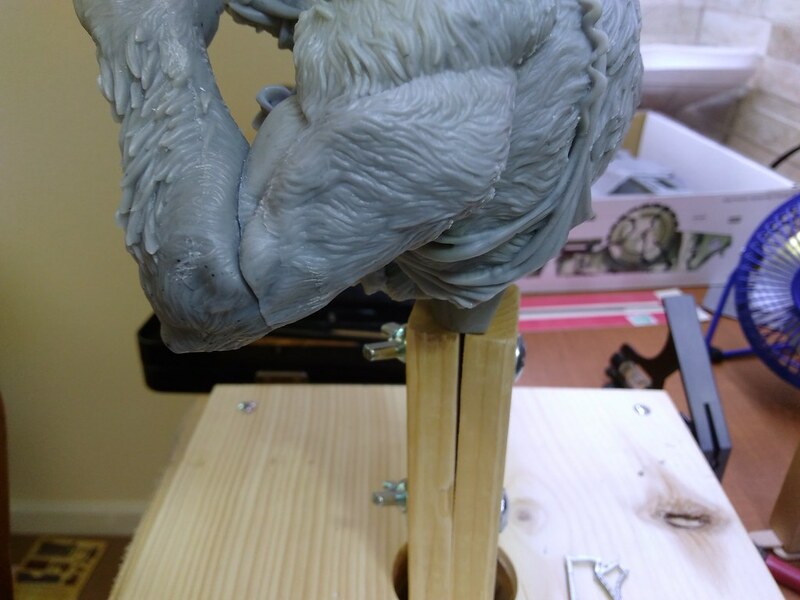 The arm joint in particular has a pretty big gap. I used millliput and filled and textured the seams. I also filled in a spot on the back. I think I need to rework the texture on this spot. All in all the quality is pretty decent. I could wish the fit was better, but it's workable. There's a lot of annoying cleanup that isn't obvious when you first look it over. If you look at the previous post, and the pictures of the back, you'll see that a lot of the hairs have little blobs on the ends that stick out. Chasing all those down, trimming them and smoothing them out has been a pain. I had to trim one of the tabs off the bonnet ribbon to get it to go in, otherwise there really wasn't a way to get the two ribbons to go where they're supposed to. They don't have any really clear pictures of what the area is supposed to look like either. Anyway, I'll hopefully finish the cleanup tonight, and be able to get some primer and base coats sprayed on this weekend. Made a little bit of progress over the weekend. Based him in black and then went over it with white. It's funny that in these pictures with the lighting you can't tell that he's undercoated in black. It all just looks grey. Hope to start getting some color on this week. When I test-fitted mine the seams were all but invisible. So it seems you got particularly unlucky. They really should have cast he glasses in metal. 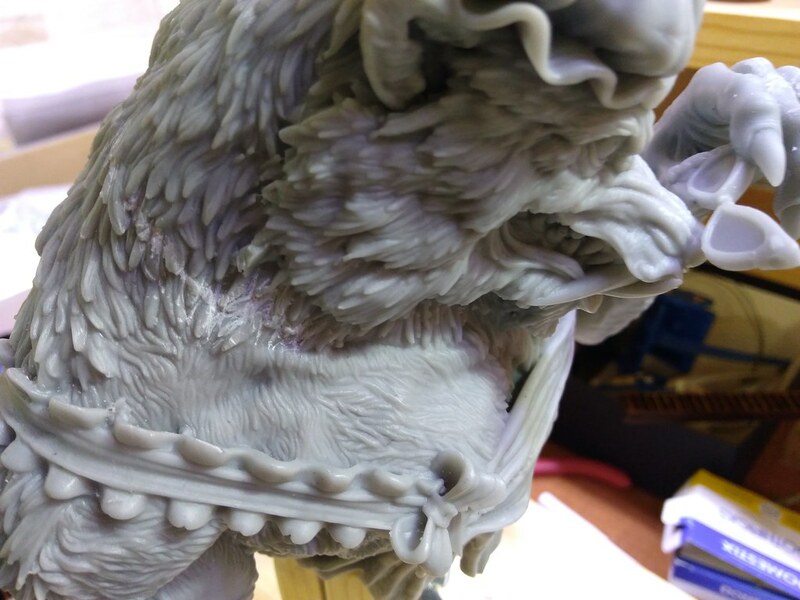 Why are you using black primer, then white? 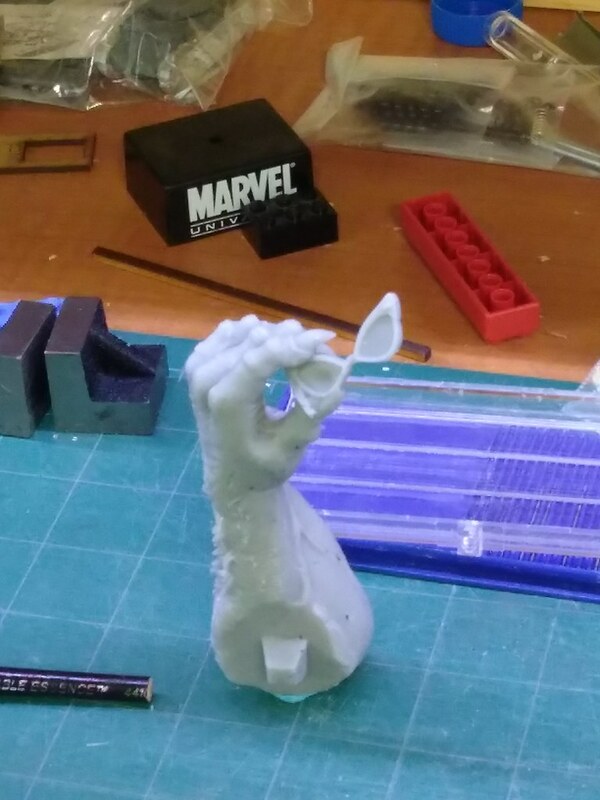 After a number of people mentioned that their glasses had broken they evidently they started sending them with the casting sprue attached to the glasses and arm to add strength to the glasses during shipping. The black and white is my attempt at zenithal. A combination of the lighting in the shots and the extra white I sprayed on the apron seems to have washed it out and made it appear as though I just painted it gray. It's a lot more noticeable in person. It's only the second time I've tried it, and the first time was in a class. We'll see how it goes. My arm and glasses is still on the sprue. But I still worry about what'll happen when I decide to start cutting it. Did you know that The World of Stuffed Greens have some very fine chain? 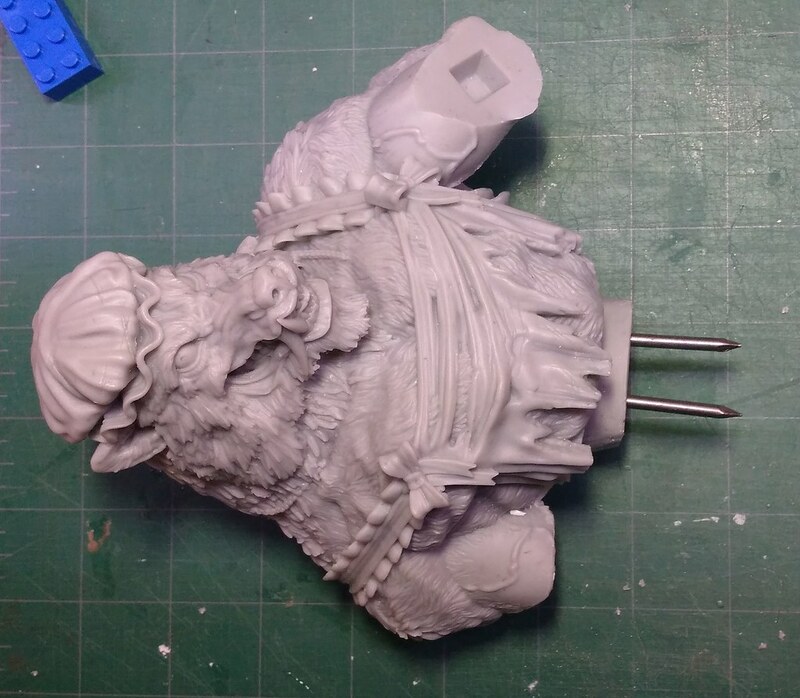 We just launched our campaign for awesome gargantuan dragons, they are 20 cm high, they will look huge compared to 32mm miniatures, the design of every dragon is also unique and different. We hope you can join us on this draconic adventure! 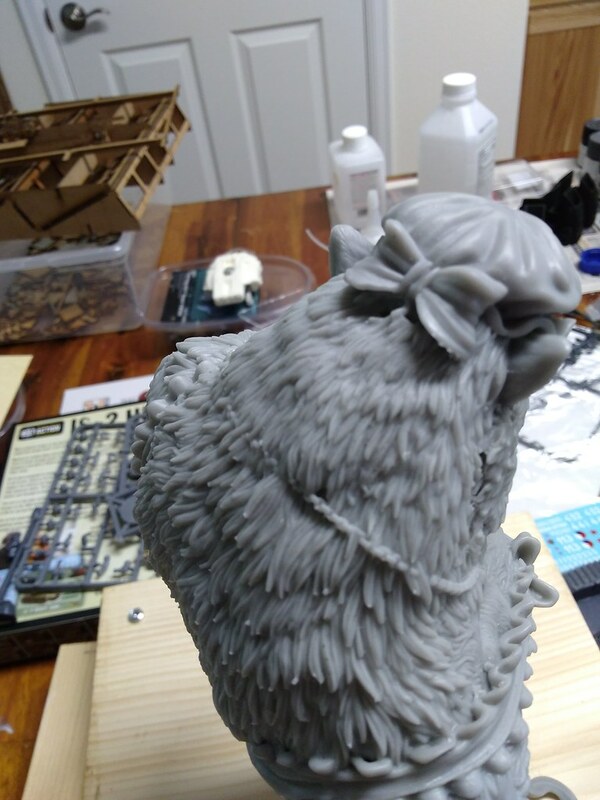 Here is a little preview of Lilyana one of our core minis for that set. 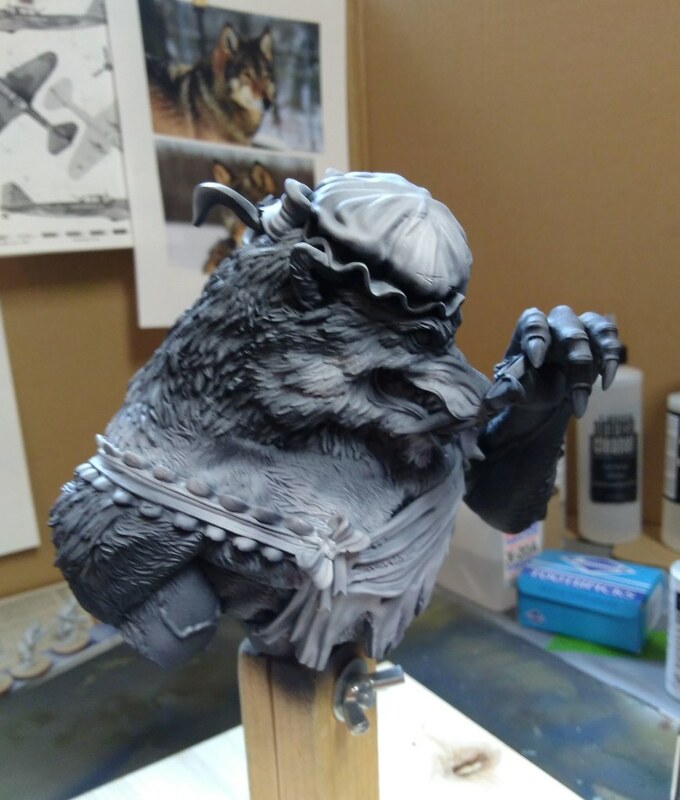 Corvus Corax Miniatures is a small hobby project created in 2013. Since then, three projects have successfully funded on Kickstarter and all have been fully delivered on time without any delays. The feedback from the backers have only been positive. 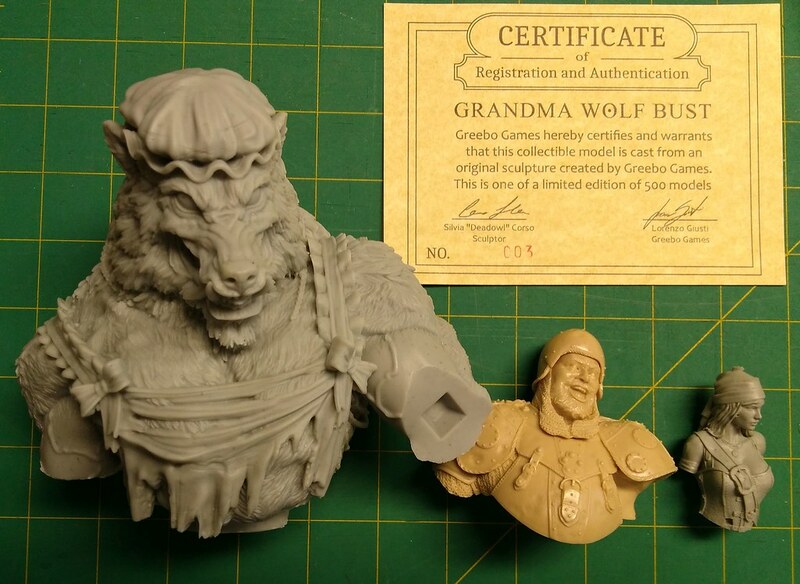 Thanks to the support through Kickstarter, 17 miniatures have been made available. 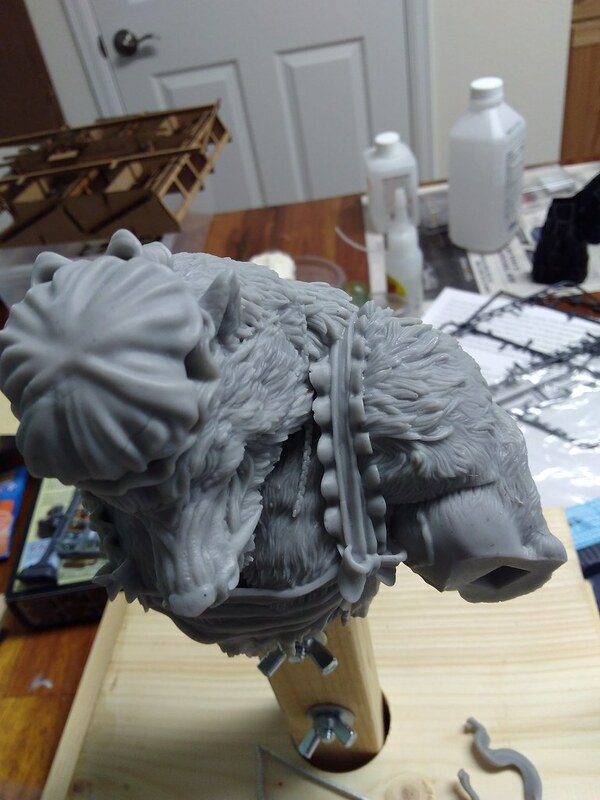 The goal of this project is to raise funds for the production a total of four (4) miniatures for the Clansmen of Caer Loch. 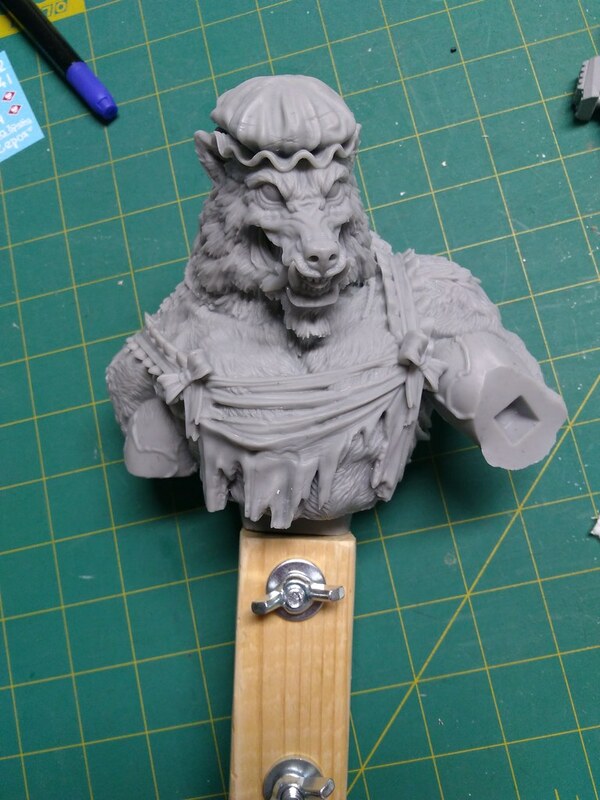 The miniatures will be cast in high quality, non-toxic resin. 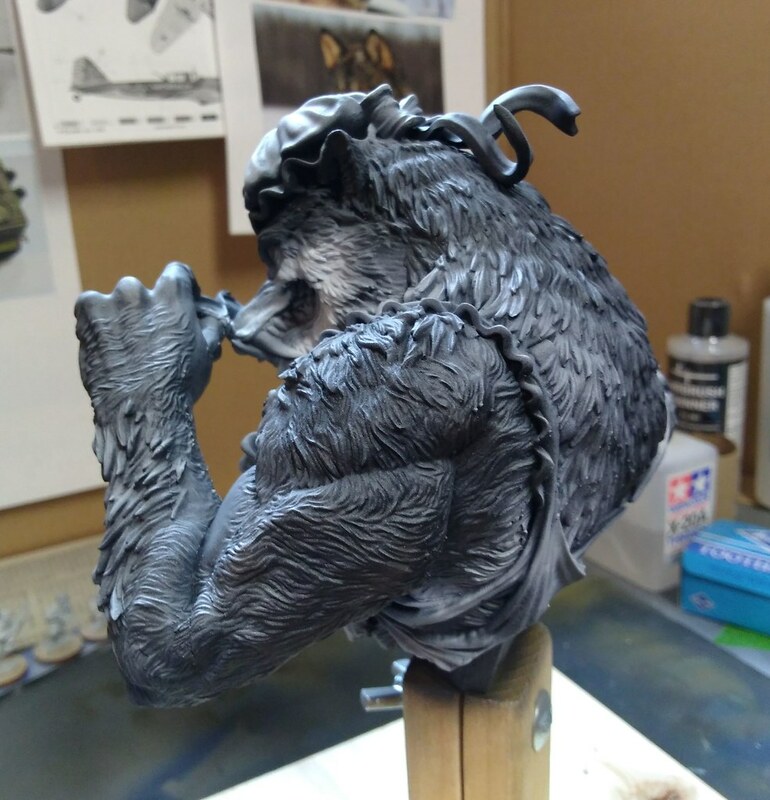 The scale of the miniatures is 35mm (measuring to the eyes in a standing, straight pose, although some characters may be slightly larger because they are supposed to be large characters).